A black and tawny yellow Zambian basket sits on my desk corner behind a stack of files. At first glance it appears to be a catchall filled with notecards, clippings and photos, its strong geometrical designs completely hidden. Sometimes I toss something else in the basket but there are weeks or even a month or two when it is untouched. Every so often I take the time to sort through the basket. 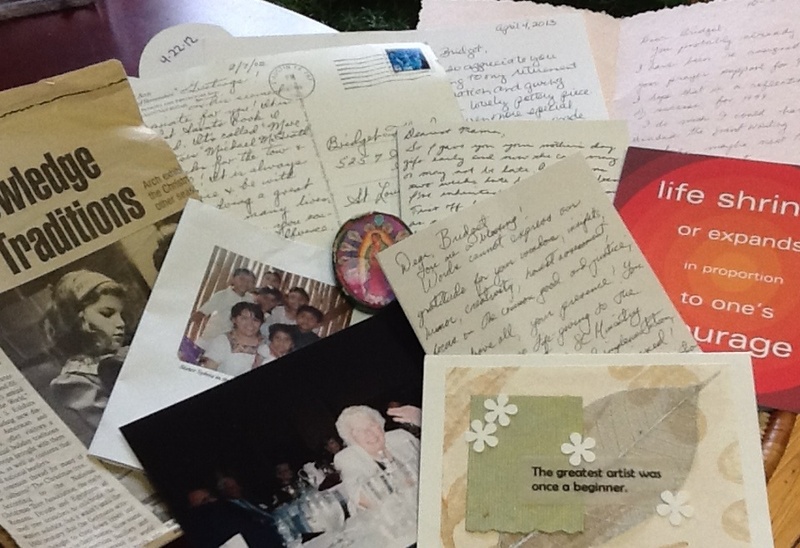 I read a note from my late mentor, Sr. Mary Ann, telling me in her precise Catholic school handwriting about how she enjoyed the care package I sent to her when she lived in Italy. Peanut butter is in short supply in Rome. There’s a newspaper clipping of my daughter, Carolyn, playing her harp at some long ago Christmas program at the Arch and a lovely card from Amelia for Mother’s Day last year. A post card I received more than a decade ago from my best friend with a cartoon about spending time gardening rather than laboring at your desk. I smile at a photo from Chiapas, Mexico and remember the time I spent with the Chol Indians and several of the Incarnate Word sisters at their organic coffee plantation high in the rainforest. The first time I saw bowls of black beans for breakfast I thought they were serving us coffee beans. A handmade note from an agency director who works to alleviate domestic violence catches my eye and I appreciate all that she does to make the world a better place. She moved to Texas a few years ago and I take a moment to send good thoughts her way. The papers, photos and cards left randomly in a straw basket serve a purpose. The basket centers me. I reflect on what I have been given by these extraordinary people and on the opportunities I have had to give to them in return.